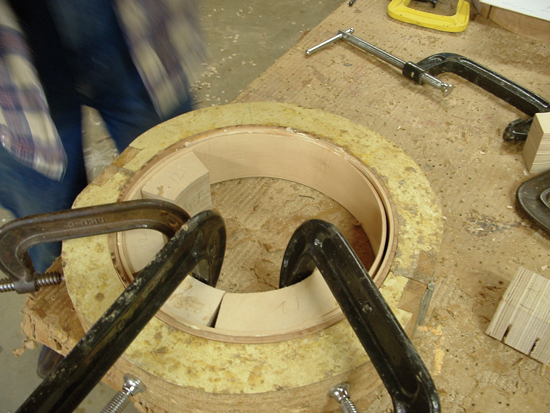 Forming the banjo rim requires the use of the rim clamping form. The inside dimension of the form matches the outside dimension of the rim. The form I use is made in two pieces so that the rim can pop right out. Mac’s rim form uses a latch and a hinge. 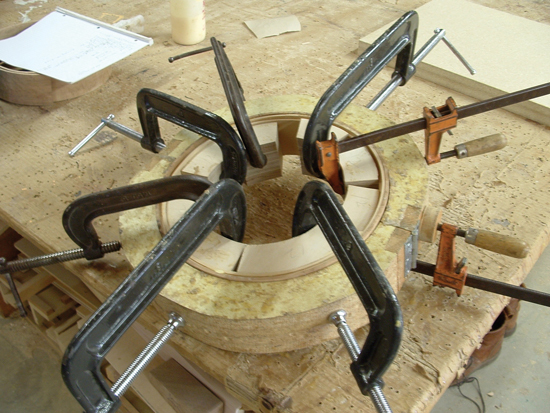 Cauls should be used to bear against the inside of the bent strips to keep the clamps from marring them while forming. This is a clamp intensive process so get all the clamps that you can, I like to have at least 7 or 8 on hand. Fit the strip that you plan to use as the outer most lamination into the form, it should be too long and double over itself at the ends. Use the cauls and clamps to get the strip snug against the wall of the form. Start in the middle and work your way around to each end, when you get there take a look and see how much needs to be cut off so that it will make one single layer and will overlap itself on the ends. Remove the strip and cut it to length. Be a little generous with this cut and bevel the ends so they will lap over one another, kind of like a “scarf joint”. Keep test fitting and modifying until the beveled ends meet each other as cleanly as possible. If it’s not super pretty that may be alright as this joint can be covered by the neck heel. Make it as good as possible, do it as many times as it takes. If it doesn’t look too good or comes out too short you can get some practice by using the intended outer strip for one of the inner strips. I suppose it is possible to make patterns to cut each successive laminating strip to length if the strips were all the same thickness every time. I find a bit of variety in my own work so I fit each strip individually. It takes time but comes out nice. For the next laminations repeat the above process leaving the previous laminations in place each time. Get the first two layers fitting good and glue them up before cutting the other layers. It is likely that some of the strips may attempt to spiral out of the form, that’s okay, so long as they don’t spiral out too far. I would consider more than a 1/4″ to be too far, depending on the depth dimension I started with. 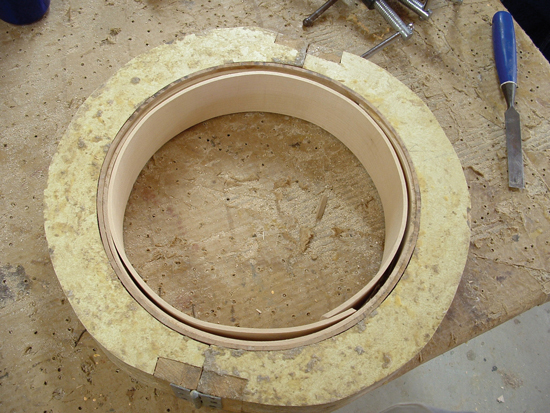 After all the laminations are glued up and cured the rim can be trimmed on the saw. I like my finished rims to be about 2.5″ deep. A little shallower is okay but not much. A rim intended to be used with the tube-a-phone tone ring is the exception, which could have a bit shallower rim because the tone-ring in that case is so tall. Finding the correct length for the outer strip and first lamination. Gluing the first and second laminations together.